Getting a little more excited for Halloween this year because instead of being Makeup Artist I'm programming myself for FUN. I bought this Robot Girl costume last year and have been piecing together accessories and makeup as I go. In case you wanted to join me in Robotland here's the data for where I've been collecting my parts! Oh! If you've come to my blog looking for my earlier Halloween Looks once again they have gone over bandwidth and aren't showing up. Most can be found on my facebook page HERE in the sfx/halloween album or HERE in the Pinterest album. Or maybe try my tutorial for one of favorite looks to do, Blind Mag from REPO. 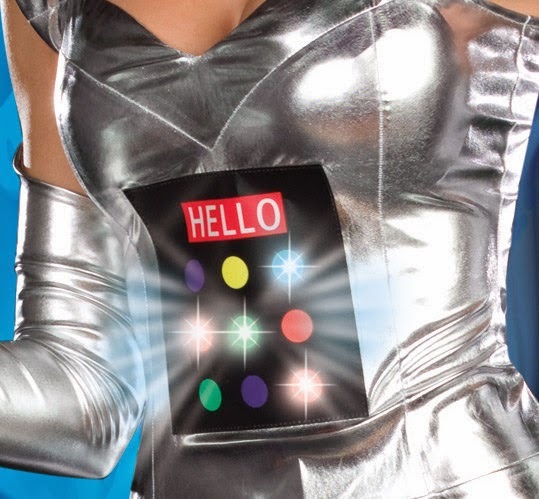 Halloween Costume: Dreamgirl RobotA Bing. This costume is sound and motion interactive and responds to voice, sound, and movement. Sold out online :( You might want to check in store at Spirit though. An alternative costume option is the Forum Outta Space Female Robot Costume . Boots are the Funtasma by Pleaser Women's Gogo Silver Stretch . 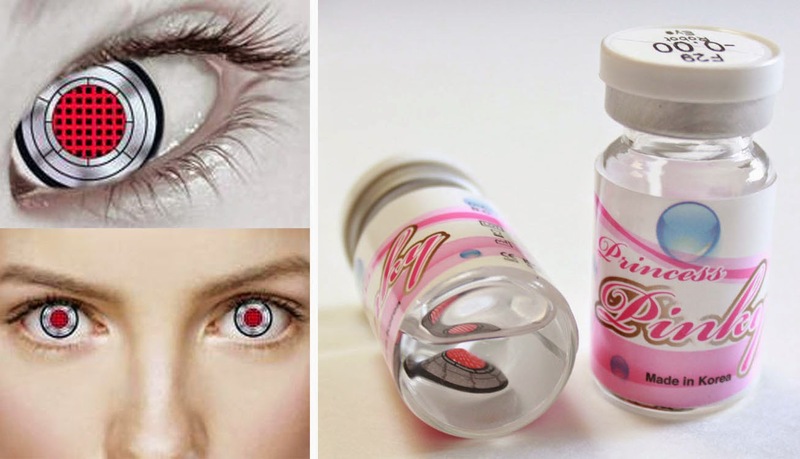 Pinky Paradise has a large selection of color, circle, and special effect contact lenses. I'm thinking about wearing just one of the robot lenses with silver lenses from SpookyEyes or royal blue ones from Eyesbright in the other eye and doing more detailed makeup around the robot eye. Red and Blue are classic robot colors. Indecisive on the colors I got both :) The Dark Blue ombre Light Blue from Diva Wigs is dreamy, teal roots gradually fading to light blue, stunning for mermaid hair. For robots though? I felt like it needed something more structured and primary so I went with a Blue long wig with blunt bangs (this is the winner!) and a Curly Red Long Wig, both from BestLaceWigs. BLW have gorgeous costume wigs. The quality is fantastic, it's not that shiny cheap Halloween wig hair and both of them were only $14.99 each. 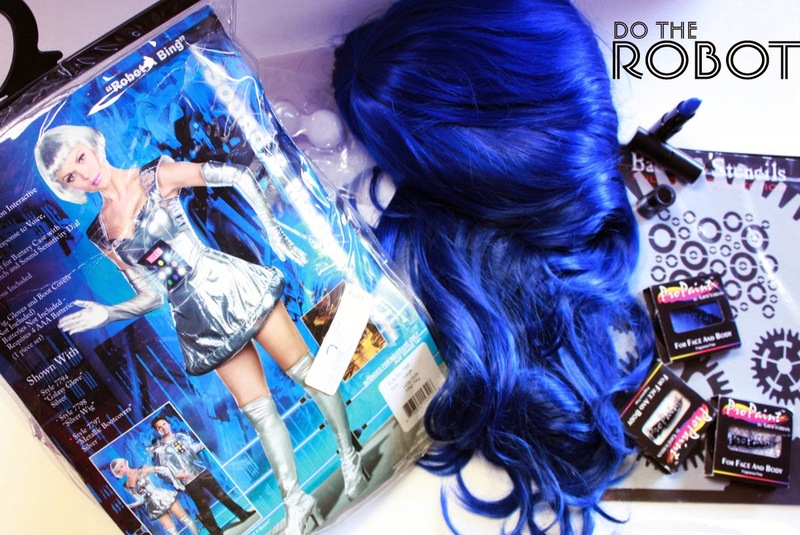 Wonderland Wigs UK also has very high quality costume wigs. Forget the cheap Halloween aisle makeup and put Graftobian on your lsit. The best special effects makeup, amazing quality, lasts all night and is affordable. Divinity Cosmetics is a new online store that carries Badass Stencils and literally all of the Graftobian products that you'll need for any costume makeup you do..EVER. Finding the right blue lipstick has been a challenging. OCC's were just a shade off and liners or paints too drying. 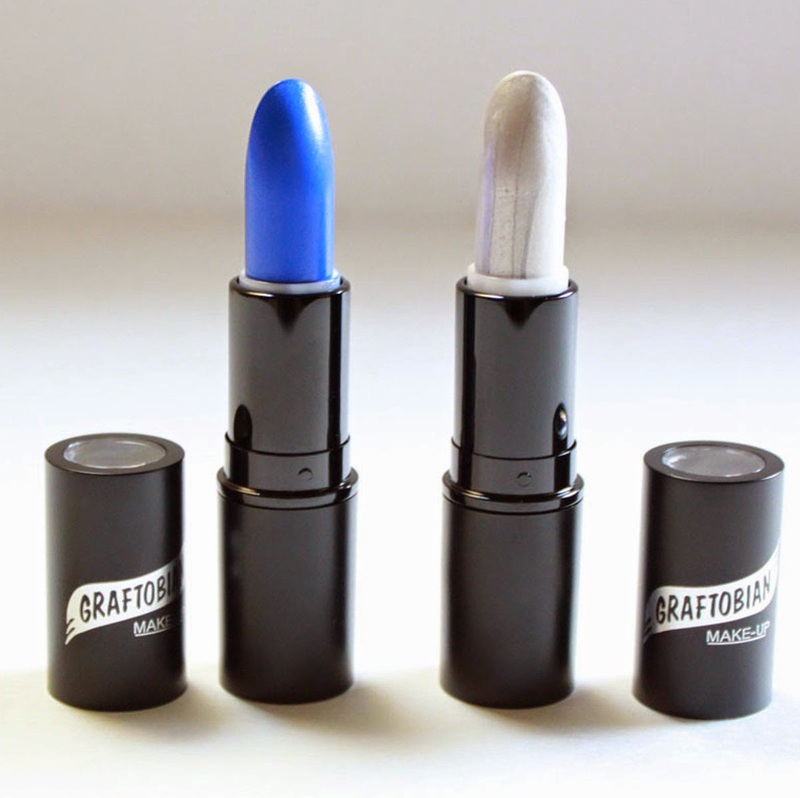 I found my match in Graftobian HD Lipstick ($8.49) appropriately named "Blue", a true royal blue. "Silver" takes a few layers to build up but the metallic translucency makes it wearable even, in a cool futuristic way. For a frozen look this one would be dead on. The formula's of these lipstick's are creamy, smooth, longlasting, and scentless. Definitely getting some of these in normal colors because they're fantastic. 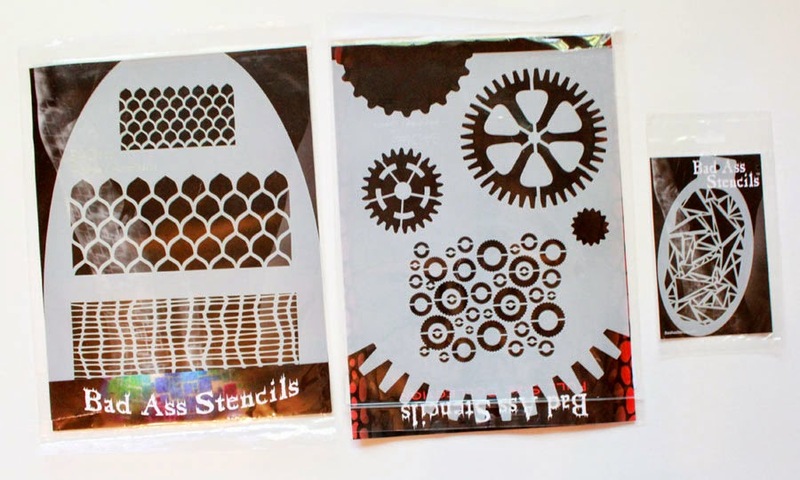 Badass Stencils ($15 Full, $4 mini) are BADASS. No spending hours drawing designs on perfectly. They're very sturdy and give crisp lines. Just place the stencils and fill them in or airbrush and you look like you're a freakin badass makeup artist. Cheating? No, we just wanna get to the party sooner! Divnity Cosmetics.com is currently having a Spooktacular Halloween Sale! Spend $100 and get $10 off ANY order at checkout with code "halloween". My jeweler aka the only boy I want buying me diamonds ;) found these and I kind of want to wear them not with a costume. Light up fake dieeeeamonds, sapphires, rubies oh my, so dope. Have a Happy Halloween! If you go roboto style, share with me!